David has been a practicing attorney since 1974 and is a graduate of Roosevelt University (degrees in Accounting and Finance) and DePaul University, College of Law (Juris Doctor, 1973). He is a founding partner of Schlack & McGinnity, P.C., and a founder and partner in its predecessor law firm, Haddad, Schlack & Associates, P.C. While managing these law firms he also founded, owned and managed two large national business corporations, United States Mutual Association and Stores Mutual Association. Prior to entering into private practice, David served as Revenue Agent with the United States Treasury, Internal Revenue Service, where he also served as an instructor for new Revenue Agents, and late as the Health Care Audit Specialist for the Northern District of Illinois. Later, he served as a Fraud Investigator and Compliance Examiner for the Bureau of Health Insurance, U.S. Department of Health Education, and Welfare, and then, as a Grants Compliance Officer with the Public Health Service of the United States Department of Health & Human Services. David is admitted to practice before the Illinois Supreme Court (1978), the United States Supreme Court (1980), United States District Court, Northern District of Illinois (1974), the United States Court of Appeals (1980), and the United States Tax Court (1979). 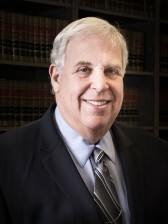 David’s areas of legal expertise include personal and business tax planning; defense of matters before the IRS; with a special emphasis on IRS Settlements (Offers In Compromise); estate tax planning; probate and decedent’s estates; business formation; ownership succession planning; and business contract matters. David is a member of the American Bar Association, the Illinois Bar Association, and the Chicago Bar Association. David is married to his wife Nancy for 50 years. He has two adult daughters and two grandsons. He has been a long standing subscriber to the Lyric Opera of Chicago and the Chicago Symphony Orchestra. © 2015 Schlack & McGinnityDesign: Sasso Marketing, Inc..